This is the only drawing that shows the face of Soane's proposed west elevation for the house; survey drawing  shows it as found. 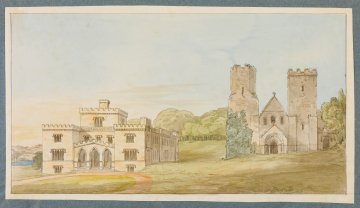 The collapse of the north aisle in the church in 1802 was what brought Soane to Port Eliot. Humphry Repton (1752-1818) in his Red Book of 1793 for Port Eliot had advocated linking the house with the church but this was not something that Soane explored. (P.Dean, Sir John Soane and the country estate, 1999, p.104).